UPDATED: DEC 12, 2018 Bouteille. Le nez est épicé, un peu torréfié et un peu fruité aussi. En bouche c'est moins impressionant, étonnament fade. C'est vraiment les épices qui sont en avant plan et on aimerait que le torréfié vienne balancer un peu plus. 12-ounce bottled purchased at brewery in Brossard, Quebec, Canada. Pours black with ruby-brown highlights, with tiny spritz of tan head and lacing. Aroma: coffee, chocolate, some smoke. Flavor: the above, plus campfire marshmallows and some hop dryness at the finish. Mouthfeel: medium-bodied, creamy finish. Apparence : Brune très foncée, claire, col brun retenu par une carbonatation active. 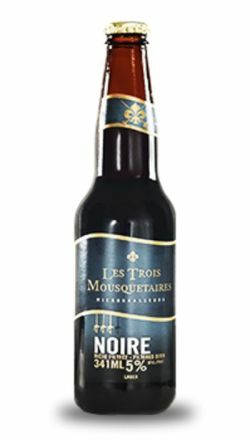 Nez : Malt torréfié, léger caramel, somme toute discret. Goût : Entrée tout aussi discrète, malt grillé, chocolat en finale. Caramel qui se construit au fil des gorgées. Faible amertume, doux sucre résiduel. Sensation : Corps tout de même mince, carbonatation moyenne-plus, assez courte en bouche. Bref : Un nez et une entrée discrets, des arômes qui s’affirment en finale. Pas mauvaise, le tout est bien balancé, bien agencé. Ce n’est pas époustouflant, mais tout de même intéressant. Merci David! 12 oz. bottle thanks to Willrunforbeer! Deep brown in color, thin lasting head. Aroma shows mild chocolate, subtle coffee, mild lager-like yeast. The flavor is the same with the addition of some mild dark fruit. (Raisin,prune) slick oily mouthfeel. Nice flavors. Poured from bottle thanks Willrunforbeer cola brown with a tan head. Aroma is toasted caramel dark fruit bread. Taste is nice light nutty roasty notes not overly sweet well balanced. 12oz bottle from my trip to Montreal. Pours dark brown with a beige head. Aroma is brown bread, mild roast. This is a touch thin with flavors of toffee, brown bread. Slightly tannic finish. Bottled. The body is dark brown with a small beige head. The aroma is cognac. The taste is hoppy and malty. Bouteille 341ml. Couleur noire opaque, mousse moka crémeuse. Arôme de malt torréfié, levure, chocolat noir. Goût de malt torréfié, petits fruits, chocolat noir. Carbonatation moyenne-élevée, corps moyen-faible. 12 oz. bottle. Pours an extremely dark amber color with a small beige head. Aroma of dark malts and stone fruits with some coffee notes. Taste is dark malt, a bit of dark fruit, faint coffee. Not much roast or chocolate present and perhaps a little thin at the finish. Appearance: Very black body with a thick, 3 finger tan head. Smell: Burnt, roasted coffee beans with bitterness, a little acrid. Not entirely inticing. Taste: Strong bitterness in the fore, almost overwhelming. Bitter chocolate and coffee are present. Tastes a little like chewing on coffee beans. Mouthfeel: Coarseness continues but mellows a bit as it warms. Just a little malt but coffee permeates the palate giving it kind of a rough edge.